The Sorby ProEdge Deluxe does just what its name implies - puts a consistent, professional-quality edge on almost any hand tool, whether a turning tool, chisel, plane blade or knife. And don't be fooled by its compact size - weighing in at over 30 lbs, with a 1/4" steel plate, this is a true industrial-quality sharpener. The patented angle setter ensures that the most popular bevel angles can be set time after time, and the thick steel backing plate ensures a dead flat sharpening surface. 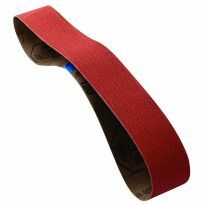 The abrasive belts can be quickly changed for anything from rough sharpening to fine honing, and because the grit can be chosen for the quickest possible sharpening, there is far less risk of overheating your tools and damaging the steel. The ProEdge Deluxe includes a skew jig, a gouge jig, fingernail profiler and three different belts. Fixed detents for the most popular bevel angles: 90°, 80°, 60°, 45°, 35°, 30°, 25°, 20°, 15°. A skew jig to give the correct presentation angle for turners' skew chisels. 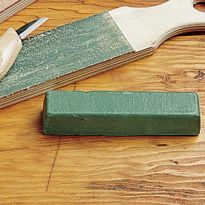 A gouge jig in the format of a V-block to prevent pivoting when sharpening a turners' gouge. This also works as a square jig for presenting square tools at 90 degrees to the sharpening belt. A fingernail profiler to create swept back wings on a turners' gouge. Bought a 8 pc set of Robert Sorby turning tools and decided to get the pro edge so I could keep them in like new condition. Well I also have several turning sets that were used that I picked up at yard sales and flea markets. Most were completely out of profile and no edge what so ever. So what the heck. Let’s see what I can do here. It’s amazing how the pro edge brought life back to these old gouges. Best thing since a pocket on a shirt! I don’t normally write reviews but this machine is awesome! My wife and I each have a set of turning tools and I was able to reprofile both sets with fantastic results. I had been using the “One Way” jig but having to “eyeball” the angle didn’t result in repeatable results. Found out that the cheaper tools we have were not at the proper angle to start with, this unit insures the proper angle. I had given up trying to sharpen our oval skew because it was just getting more messed up. Now it is razor sharp and ground to the proper angle. I was able, very easily, to change our spindle gouges from the standard profile to the fingernail grind with no problem. Be sure to purchase the “pro-set” gauge, doesn’t come with this unit, if you want to do the fingernail grind, otherwise you will have to “eyeball” it. 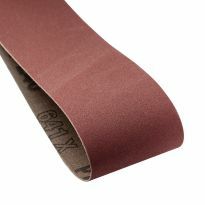 Order “several” 60 grit belts if you are going to reprofile some tools. The ceramic belts last longer. I love this machine wish I had got it instead of a low speed grinder and OneWay jig to start with. Good tool. It’s a shame Rockler doesn’t stock all accessories that are available for this wonderful machine. Very well made and easy to use. Grinding my lathe gouges has never been easier. I am so glad I purchased this. It is very easy to use and I couldn’t be happier with the results. My tools have never been so sharp. Buy it , you won’t regret it. I was not sure which sharpening system to buy for my turning tools. The staff at Rockler gave me some good advice and I chose the Sorby system for its easy of use. Brought it home, took it out of the box and I was ready to sharpen tools in just a few minutes. It is very easy to use and worked on all my tools with the attachments included with the unit. I highly recommend it. This is a fantastic and very easy piece of equipment to use! Wish I had gotten it years ago! The product arrived on time and in good shape. I have only used it to sharpen my lathe tools but it has done an excellent job. Much better that a sharpening wheel where you can get the angle wrong. I have sharpened a number of bowl gouges and scrapers and they have all came out sharper then using a wheel. I highly recommend this product. Easy and fast! I would rather spend my time at the lathe than the sharpener. Works great for sharpening my turning tools. Go ahead and get the pro set jig, makes it a lot easier to sharpen gouges. 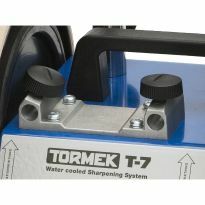 I was worried because of the cost that I might be disappointed in the value of the sharpening system. However, after I got it set up and used it, I see that it is an essential tool in the wood turning arsenal. It works as promised and, though priced a little higher than it needs to be, yet it is a great tool. Best all around sharpening system for turning tools. I've tried many, but this one is the best. I have used the sorby for 4 months and it has been fantastic. this unit is one of the best sharpeners on the market today for the price and versatility .fast easy to use ,changing belts quickly and easy. the support for the belt needed to be adjusted so the belt is level or just above the side plats covers of the unit, other than that, it is the fastest ,easiest, and most versatile sharpener on the market today . Great sharpening system, works well on all my turning tools. I wish it came with more adapters to do my hand carving tools. The first system that I received in the mail it was broken Rockler replaced it immediately with no problems great place to order from. I purchased this sharpener because I wasn't able to properly sharpen the Robert Sorby Sovereign set using a bench grinder. 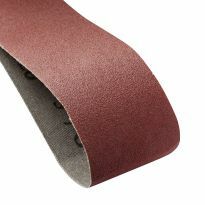 I purchased the 60 grit ceramic belt which I would recommend. The 60 grit belt that came with the sharpener wore out very fast, the ceramic is still working. After the initial sharpening is done using 60, then 120, then 240, you will be very happy. I did have two issues with the sharpener. First the finish on the table is poor and the jigs for the skew chisel and gouge would not slide. I polished it with sandpaper and it works better, but still not what I'd like to see. Second, the table was not square to the backing plate for the belt and the guide for the gouge jig was not square to the jig. By the time I figured that out, I had to start over sharpening the gouges. Both were fairly easy to square, but a piece of equipment as expensive as this, should come ready to use out of the box as advertised or have setup as the first step in the manual. There isn't even any setup in the manual. I gave it 4 stars because of this. Well built, used with the various available jigs it makes a flat grind I can’t get with CBN wheel. Belt changes are quick, and the trizact finer grits hone nicely to a fine edge. One star off for lack of dust coillection; it generates plenty of dust, so the big open square in the base will provide a place to attach a heat resistant duct to a ˆmetalˆ dust collector like the Jet 505 or Grizzly unit [can’t use a wood dust collector due to fire hazard]. Wear dust mask, safety glasses etc. when using this machine. Works very well. It didn’t take very long to have all of my lathe tools and chisels dialed in. They work much better with the flat grinds as opposed to the hollow grinds from a grinding wheel. I did need to order the longer tool post because some of my gouges didn’t work with the small one. 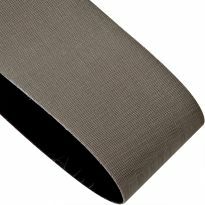 The belts from Sorby are quite expensive, but Kingspore offers the 30.5 inch by 2 inch belts at a much more affordable price. It does a good job at sharpening tools. You have to remove the side cove every time you change the belt, and the screw for adjusting the tilt is difficult to get to once it's tilted. There is a learning curve with the V tool rest. 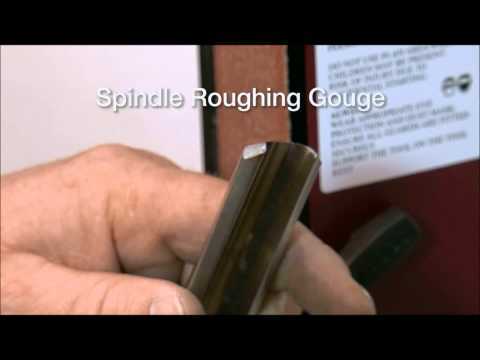 You have to apply downward press while turning the gouge. A bit tricky at first but overall I think I made a great choice. A very well made tool. This is essentially a belt sander sharpener. The money features are the angle adjustments on the side. To adjust the angle, you loosen a bolt then shift to another hole. It is quick and easy. Out of the gate, this is pretty perfect for HSS turning tools, watch the youtube videos and you will be fine. Where I think it is skimped is the accessories. There is a fair amount included, but for the price, it feels a bit much. I have carving tools as well that I wanted to sharpen, but the angle plate is too deep. You haee to buy another plate that is shallower and doesn't have the guides in the little miter slot. All in all, it was a good purchase and I didn't regret it. I never got to try it. It was delivered from UPS so damaged that I immediately returned it. Still waiting for Rockler to pick up the other package, extra sand belts, which are no longer needed as I returned and cancelled the order. It wasn't a very enjoyable Rockler purchase. Not so much as a "we're sorry" from anyone. Sorby is a quality name, the reviews were at the top with 5 stars, and of course the sale price helped ! Have had several outstanding recommendations from friends who have used this system. After thorough review of all the many different sharpening systems I selected this item based on my experience with Sorby products that I own and the thorough reviews of this sharpening system I viewed on the Rockler website. I exclusively use Sorby chisels and gouges, and I care about maintaining their edge. This is expensive, but seems very versatile and not much more than a few quality stones and a diamond board to keep them flat. I prefer the electric option. Price, reviews, YouTube videos of sharpening system in action. needed a reliable repeatable system for sharpening my woodworking tools. Want a quick and easy way to sharpen lathe chisels with quick and easy angle adjustments. Seemed like the most versatile product for sharpening all types of woodworking tools, especially lathe tools. I am always trying to get the best edges on my tools quickly. Need to sharpen lathe tools. This system gets very good reviews. I like the fact that a lot of people that own it, comment on how well it is made and how easy and well it actually works. I like the fact that I won't need to buy a lot of adapters, that other systems require and also the replacement belts are not excessively expensive. Best reviews, good YouTube demo. This is a great tool, easy to use and works with many different tools. can I sharpen lawnmower blades with this machine? Can you reverse the direction of the motor? BEST ANSWER: No, the motor does not reverse and it is important that the belts are installed the right direction. Thinking about buying this sharpener but need to know if it will sharpen small carving knives? This is what I would be using it for is all my carving tools would this be a good choice for me? BEST ANSWER: Yes, with the right jig. Rockler has them in stock. Since all I've sharpened on mine is chisels and plane irons I can't directly answer your question. It is a great sharpening system though, so I would imagine it could be used on carving knives to success. But like I said I have no experience with those. It is the best sharpener i have ever used to sharpen my carving tools. I like it because it does not hollow grind them it is a flat grind, also works fast. I have only used the Sorby sharpening system for my turning tools. I don't carve, therefore, can't say how the system will work for these tools. I use it for everything. 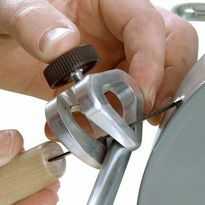 It works great on all carving, turning and any other tool you want to sharpen. GREAT machine. It seems most of not all are using this machine for turning tools. Has anyone used it to sharpen chisels and plane irons? BEST ANSWER: The short answer is YES. I just sharpened a new plane iron on Saturday 3/16/19. The machine work GREAT it is so on the money that you can not believe it. I wish it was on sale when I bought mine. It was still worth the $ 100.00+ dollars more that I paid for it. Made the money back more than once by helping others get their tools sharp. You will never regret this purchase. Well maybe you will find all kinds of family members that will want you to sharpen their items just take up time. I have used the Sorby System for both my turning tools as well as chisels. Have yet to try plane irons. What I like about the system for wood chisels is the ability to put a double bevel edge. While using it primarily to sharpen my turning tools, I've used it to sharpen my wood chisels with much success. 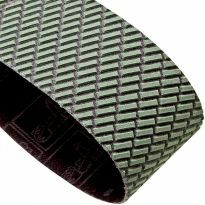 It generally sharpens anything that you can fit on the surface of the belt. Can this unit be used to sharpen machine tool bits, such as used in a mill or metal lathe? BEST ANSWER: Yes, absolutely, if you are talking about sharpening high speed steel tooling. No, if you are thinking of carbides. I would rough out the general shape of the tool on a bench grinder and then move over to the Sorby to finish off rake and side relief angles and put sharp edges at the corners of adjacent faces. You'll get a much smoother, more refined surface with the available belts for the Sorby which should result in less heat buildup and longer wear. I do not think that this would be a viable way of sharpening milling cutters like slot or keyway cutters or face end mills. Those all require special jigs and holders that would be difficult to adapt to the Sorby. But, for any kind of single-point HSS tooling it will work fine. I've been using mine to sharpen HSS metal lathe tooling, knifes, wood turning tools chisels, plane blades, and so forth it's versatile and you can get belts down in the 1500 grit range. It will put a polished surface on cutting edges. I do not think there are any diamond belts for carbide, nor could I afford them if available. I don't know if you noticed but the carbide tooling for wood turning is all based on disposable inserts. Rotate to a new edge or turn them over, and dispose when used up. Kind of like inserts for metal machining. I am not an expert on those bits, but if it's anything like a router bit, then no. It would be way too small to handle safely and I don't think you'd be able to get the right angle or even get the edge to sit right. This tool is essentially a belt sander with a more accurate angle system. You should be able to sharpen bits with the Sorby System. The only difficulty being able to hold the bit in a stable fixed angle. I would suggest using a MT2 drill chuck to give you something better to hold on to. this tool can sharpen almost anything with the right accessories and belts. outstanding unit. No, only for wood lathe tools and kitchen knives. Is a knife sharpening jig available for this? BEST ANSWER: Yes, they have a small knife and a large knife jig. Yes, a small knife and a large knife jig. I own a number of router bits with both 1/4" and 1/2" shafts. I currently have no really good way of sharpening them. The Sorby ProEdge ads mention router bits but provide no information on how. Will this pricy tool sharpen router bits and drill bits? Show me how. Can Rockler stores answer my questions? BEST ANSWER: While I have not personally tried to sharpen router or drill bits on my Sorby ProEdge, I don't see any reason that could not be accomplished. 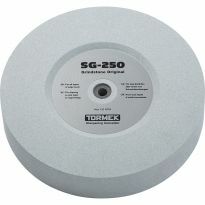 It does a Great job on my kitchen knives and my lathe tools and chisels. It would just be a matter of getting the bits at the proper angle and making a jig to safely hold them due to their small size. I have found the ProEdge system very versatile. I had it in my mind that I had seen a You tube video on sharpening bits but I haven't been able to relocate it for you. Also check with your local Rockler store, the Sorby rep. is making the rounds to the stores and will take the time to talk and show you in detail all you need. I Have this sharpener and it works great on angles. However, I haven't used it on bits, I think it would work. How does this sharpening system compare with the Rikon 8 in slow grind - wolverine jig system? 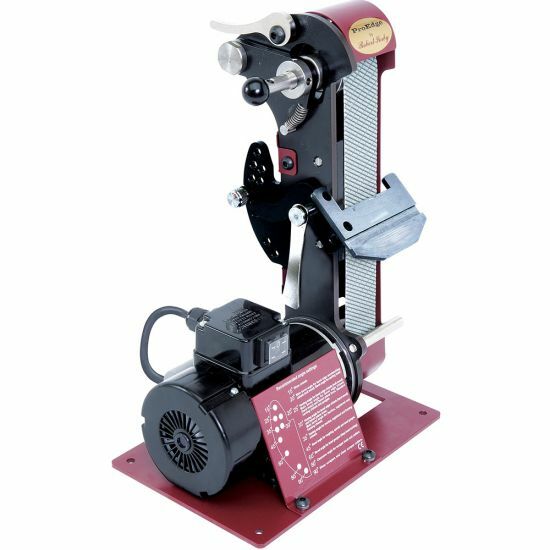 BEST ANSWER: I compared prices between the Sorby system and the Rikon slow grinder, once I upgraded the sharpening wheels the system would cost me almost as much as the Sorby. The real benefit is the ease is setup making the sharpening process faster and I feel more accurate. The setting are located on the machine itself once you have the setting set for the proper angle the Sorby sytem will give you the right angle everytime. I am glad I upgraded instead of buying the Rikon grinder and wolverine system. I have never used the Rikon 8 so I cannot compare the two of them. I can tell you that the Robert Sorby pro edge is very quick to sharpen and also to change belts. Just make sure to have a bowl of water around because the tip does get hot pretty quick. When the belt is no good any longer it only takes a couple minutes and your back in business. I hope this has helped you. If you have any other questions just let me know. Is this a common belt size or are all the belts that will fit a proprietary thing? It looks to be about 2"X42" is that right? BEST ANSWER: The belts are proprietary to this machine and their quality is better than any after market belt. Good question, sorry but I don't know. I stocked up on belts when I bought the sharpener. diameter of shaft that holds the fingernail jig on the body of the pro-edge machine? BEST ANSWER: The diameter of the “fingernail boss bar” that is attached to the body of the ProEdge is 12.5 mm. The diameter of the shaft on the fingernail jig is 12 mm. I love my machine, have owned for 2 years. Is the belt at least 2" wide. In other words will it sharpen the full width of a large plane iron? The belts are 1 15/16" wide. You would have to slide the blades a little left and right. Will it sharpen 13” planer blades? BEST ANSWER: Perhaps, however you would need a jig (likely created by you), in order to hold the blade perfectly flat and at the correct pitch / angle .This theoretical jig would also need to slide horizontally from side to side while maintaining all of the above. A Torek will do the job,slowly. 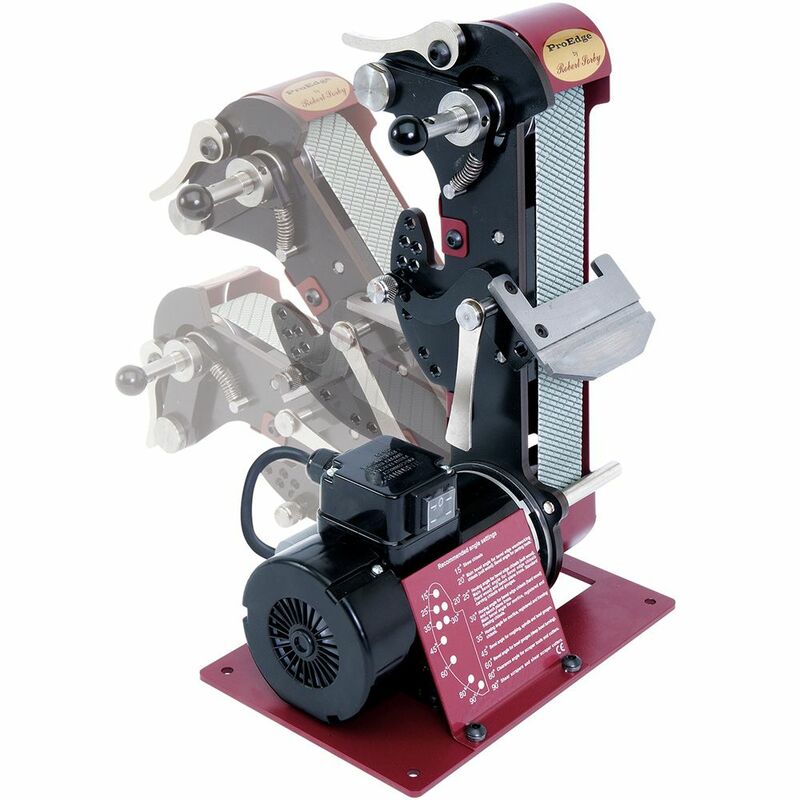 You can purchase the single use sharpening device at or around $USD 300.00. Remember,that nearly all planer blades have Titanium Carbide as the cutting edge...very tough material. IS CERAMIC OR ZIRCONIUM BELT BEST FOR HSS ? BEST ANSWER: Gene, I have used aluminum oxide, zirconium, and ceramic and for the extra cost I prefer ceramic. i see where you sell belts for this system how about other accessories such as different jigs? How do you sharpen small carving tools ? Hi, is it possible to Sharpen consistently large butcher knives 12"- 14" inches? 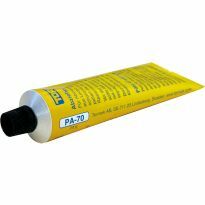 Micro Fine Honing Compound, 6 oz.